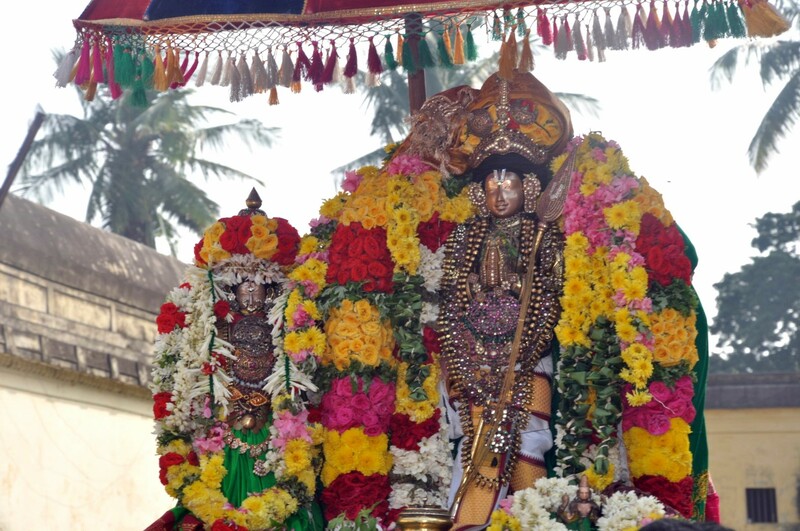 AzhvAr, thirumangai AzhvAr is – As said in ‘venRiyE vENdi veezh porutku irangi vERkaNAr kalaviyE karudhi [periya thirumozhi – 1.1.4]’ (going after victories, and longing for perishable things, and wishing for union with women of spear-like-eyes), he was of extreme haughtiness that one had to wonder whether everything including the worlds of sarvESvaran are under his thighs, and having the dhEhAthmAbhimAnam (considering body to be non-different from soul) as the reason for it, and so due to that, as said in ‘sAndhEndhu menmulaiyAr thandanthOL puNarinba veLLathAzhndhEn [periya thirumozhi – 6.3.4]’ (I got immersed in the ocean that is ecstasy of embracing the big shoulders of women wearing kumkum (red powder) who are having tender bosoms), he was being a vishaya pravaNar (interest in worldly pleasures) such that he was not eligible to gain any knowledge about AthmA or any knowledge about emperumAn. seeing this, AzhvAr, starting from ‘vAdinEn vAdi [periya thirumozhi – 1st centum]’ through ‘oru nal suRRam [periya thirumozhi – 10th centum]’, got immersed in the divine abodes of emperumAn, considering them as ones to be surrendered to, as the means, and as ones to be enjoyed. like how an extremely thirsty one might jump into the water, pour water on himself, etc., AzhvAr thought of sustaining himself by talking about Him by mouth, prostrating Him by his head, thinking about Him by his mind, and so got into doing that – that was in thirukkurunthANdakam. 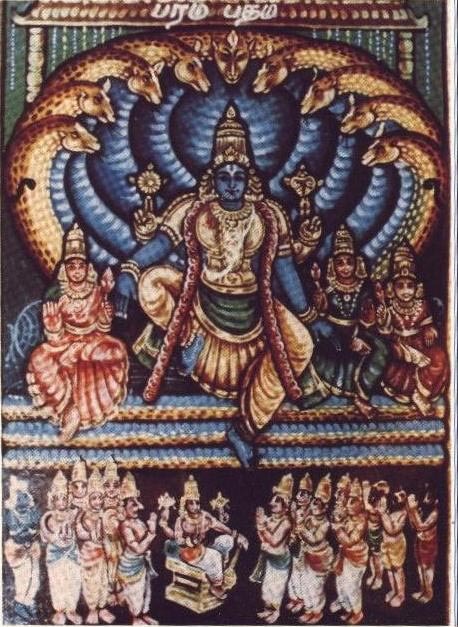 Like how water that is drunk for quenching great thirst would itself create thirst due to hurrying, that singing became an instigator for the existing love towards Him, and so in thiruvezhukURRirukkai , he, with great love, surrendered to him, as in ‘nin adiyiNai paNivan varum idar agala mARRO vinaiyE [thiruvezhukURRirukkai]’ (am surrendering to your two divine feet for the removal of hurdles that may come in the way (of reaching You); please remove those hurdles by your mercy). He did not show up even for that; AzhvAr thought that emperumAn is thinking that there are these temples which stand for the ultimate level of neermai which are as if that is the real abode of emperumAn; and so AzhvAr said the he would destroy that neermai that is in the temples which are the desired abodes for both of them – this was in periya thirumadal. emperumAn thought that if He does not show up even then, then the world would be considered as not having any eeSvaran (controller), (as AzhvAr might try to erase that if He does not show up), and so showed Himself to him like He did for prahlAdhan et al, and so made Himself, AzhvAr and the world to be truly existing (per nature). Unlike the other AzhvArs, and unlike the divine daughter of king janaka (seethai), this AzhvAr would be having intolerable delicateness (of mind) when having separation from emperumAn; that is, when separated, as said in ‘um adiyAr ellArOdum okka eNNi irundheer adiyEnai [periya thirumozhi – 4.9.6]’ (You are considering me to be at the same level as your other devotees), can you consider me who cannot tolerate separation for even one moment, along with other AzhvArs who can enjoy like malaiyALar Uttu (those in the place of malayALam (kEraLA) can eat food of four days, and can also stay without food for four days), and can tolerate for some days when separated, and along with divine daughter of king janakar who was separated from Him for ten months? So, he enjoyed as emperumAn showed him the aspects of chith, achith, and eeSvaran, and as said in ‘adhanil periyavennavA [thiruvAimozhi – 10.10.10]’ (my love which is greater than chith (sentient beings), achith (insentient beings) and eeSwara (supreme lord)), not getting enough of it to match his devotion, he calls with a great desire, and then, he concludes by talking about him getting satisfied by attaining SrIvaikuNtam as said in ‘avAvaRRu veedu peRRa [thiruvAimozhi – 10.10.11]’ – in this prabandham. This entry was posted in iraNdAm Ayiram, thirunedunthANdakam and tagged thirunedundhandagam on May 18, 2017 by raghuram.